Abstract: Late January 2017 saw a significant realignment of rebel and jihadi factions in Syria. Following aggressive moves by al-Qa'ida-aligned Jabhat Fateh al-Sham, a number of rebel groups sought protection under Ahrar al-Sham. In response, Jabhat Fateh al-Sham and its main allies announced the formation of a new umbrella group, Hay'at Tahrir al-Sham, headed by the leader of a hardline former faction of Ahrar al-Sham. If the lines between the two blocs harden, a confrontation between them could further weaken the rebel position in Syria. A variety of rationales can be suggested for the formation of Jaysh al-Ahrar,d but the foremost reason for its emergence was to pressure Ahrar al-Sham to merge with Jabhat Fateh al-Sham in some way. Conversely, other elements of Ahrar al-Sham were pushing back against the merger, knowing that formally uniting with Jabhat Fateh al-Sham would lead to isolation from the group's foreign backers,e especially Turkey. Since launching operations in north Aleppo countryside under the 'Euphrates Shield' moniker in late August 2016 (countering both the Islamic State and the Kurdish-led Syrian Democratic Forces) and since the retaking of Aleppo city by the regime, Turkey's insistence on Assad's departure has become less and less vocal. Turkey has also been working with Russia to secure its interests in northern Syria, with the latter even providing some air support for Euphrates Shield.2 Ahrar al-Sham has been participating in Euphrates Shield as well,f clearly to the chagrin of those who came under Jaysh al-Ahrar and wanted closer relations with Jabhat Fateh al-Sham. In a statement released on January 24,9 Jabhat Fateh al-Sham characterized its attacks as preemptive, citing the airstrikes and Astana talks as measures designed to isolate and attack the group. Jabhat Fateh al-Sham therefore argued "it was necessary for us to foil the conspiracies and push them back before they should come about." At the same time, the group was careful to push back against being equated with the Islamic State, emphasizing that it was not declaring takfir on the other factions (i.e. it was not pronouncing them to be apostates from Islam, something for which the Islamic State is notorious). Of the factions addressed in the call, five out of six heeded at least in part the call to merge with Ahrar al-Sham, issuing a joint statement on January 26 that they would join the group.j The clarification 'in part' is used here because for two of the factions that heeded the call—the Shami Front and Jaysh al-Islam—fighters in only specific geographical sectors declared a merger with Ahrar al-Sham. The distinction appears to have been based out of necessity. In the case of the Shami Front, this entailed its more vulnerable west Aleppo countryside-based contingents, while for Jaysh al-Islam the merger only applied to its more vulnerable northern affiliates. The main contingents of both groups are based in north Aleppo countryside (k) and East Ghouta, respectively, where Jabhat Fateh al-Sham has no significant presence that could pose a threat and where these groups are larger than Ahrar al-Sham. The one faction that did not heed the call to merge, Faylaq al-Sham, likely refrained because it has stronger, more substantial assets than Ahrar al-Sham in the north Aleppo countryside (l) and is more powerful in northwest Syria than the Shami Front's west Aleppo contingent and Jaysh al-Islam's northern affiliates. Therefore, it would have no need to seek protection in Ahrar al-Sham. Essentially, the choice for the wider Syrian insurgency at this stage is to work more closely with Jabhat Fateh al-Sham by joining the new Hay'at Tahrir al-Sham (or at least following its lead in strategic moves) or to work more closely with Turkey,20 which can mean joining Ahrar al-Sham, though it is by no means the sole option in this regard.r Neither of these options can realize the original goal of the insurgency to overthrow the regime. Indeed, though Hay'at Tahrir al-Sham clearly espouses that goal and rejects notions of ceasefires, the best it can hope to achieve in the foreseeable future is limited gains of rural ground against the regime. At this point, the forces backing the regime are too strong for the insurgency to be able to take over any major Syrian cities, in part or in whole. Working more closely with Turkey will also not lead to major territorial gains for the insurgency, in light of Turkey's wider policy shifts and rapprochement with Russia in particular. However, there is the possibility Turkey will act as a guarantor to preserve the remaining territory of the insurgency in the north in the medium to long term. It may even be the case that Turkey could eventually intervene on the ground in Idlib province, somewhat similar to its intervention as part of Euphrates Shield, but aimed at limiting Hay'at Tahrir al-Sham's influence in the northern border areas. Despite some arguments offered by Hay'at Tahrir al-Sham supporters denouncing analysts who would see the new group as essentially al-Qa'ida,21 there appears to be little distinction in reality. 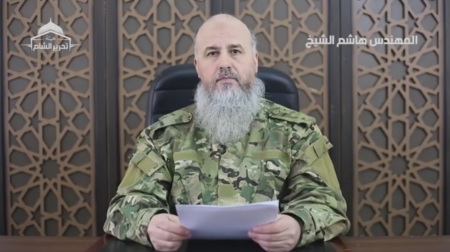 Jabhat Fateh al-Sham likely constitutes the largest single component of Hay'at Tahrir al-Sham, with al-Julani rumored to be the military commander of the new entity.22 Regardless of whether some elements of what was Jabhat al-Nusra/Jabhat Fateh al-Sham have rejected joining the new entity (e.g. the Jordanian Sami al-Oreidi)23 for whatever reasons, Hay'at Tahrir al-Sham fits in with the al-Qa'ida vision of integrating more deeply into the wider Syrian insurgency to establish a broader popular front and pushing for the end goal of an Islamic emirate or government project as a stepping stone to reviving the caliphate. Incidentally, it may be the case that this dynamic of continuing to seek popular support prevents a Hay'at Tahrir al-Sham campaign to bring down Ahrar al-Sham, thus reinforcing a strategic stalemate between Hay'at Tahrir al-Sham and the wider insurgency. [g] The precise, detailed reasons for the failure of merger talks involving Ahrar al-Sham and Jabhat Fateh al-Sham are a matter of dispute. Going into the debate in-depth is beyond the purview of this article. The director of Harakat Nour al-Din al-Zinki's media office (now part of Hay'at Tahrir al-Sham) referred this author to the lengthy testimony conveyed in tweets of Sheikh Hussam al-Atrash of the group (who is also part of Hay'at Tahrir al-Sham now) about various merger projects. This testimony can be viewed at https://justpaste.it/135v1. [h] MOM is military operations center in Ankara created by Turkey known by its Turkish initials. Its purpose is to coordinate rebel activities in Syria, and the CIA is reportedly a participant in the operations room. Erika Solomon, "The rise and fall of a US-backed rebel commander in Syria," Financial Times, February 9, 2017.